Thailand claims to be as one of the ideal location for spending vacation. The place will leave you in love with it. At Journeyfix, we provide Thailand Honeymoon Packages with a comfortable 6 nights and 7 days stay at the hotel, having all the modern amenities. Our expertise in packaging the best deals for the customers is what has brought us at a leading state. At Journeyfix, we offer you Thailand Tour Packages and Thailand Holiday Packages which will initially take you to the streets of Bangkok, discovering the region in Thailand and also to the celebrated land of Pattaya and lots more, enveloped with scenic beauty of the kingdom. After Breakfast, Check-Out from Hotel & Keep your Luggage at Hotel Lobby to see Bangkok City at last Glance till your Airport Transfer Time for Flight. Families Can Choose additional Tours in Bangkok Like (Dream World Theme Park, Safari World Zoo & Marine Park, Siam Ocean World Bangkok but Better advise if you wish to choose any of Tour then Extend your 01Night more in Bangkok City then it will be pleasant & Relax Journey. Nong Nooch Tropical Botanical Garden- Located some 15 kilometers east of Pattaya. The 500-acre (2.0 km2) site has well maintained botanical gardens and an orchid nursery. Moreover the facility has lively cultural shows in a Thai village setting. In addition trained chimpanzees and elephants are seen at the garden. Other attractions in Pattaya: The Million Years Stone Park and Pattaya Crocodile Farm, Elephant Village, Pattaya Park Beach Resort Water Park and Funny Land Amusement Park, Siriporn Orchid Farm, Underwater World Pattaya (world class aquarium), Thai Alangkarn Theater Pattaya(cultural show), Bottle Art Museum, Mini Siam, Ripleys Believe It or Not Museum, and Walking Street. Discover other regions also Phuket, Krabi, Koh Samui, Chiang Mai, Hua Hin. This Country is one of the most gorgeous and fascinating holidaying destination of south East Asia. Endowed with breathtaking natural beauty, inspiring temples, romantic beaches, it also provide blend of leisure, entertainment and vacation to make the Thailand tour enjoyable & outstanding for travelers. Other tourist destination cities in Thailand are Chiang Mai, Hua Hin and Phi Phi Island. 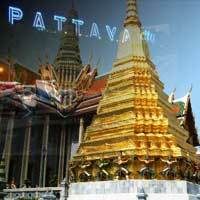 Travel deals to Thailand are available online and you can book cheap holidays in Thailand. Thailand tour packages usually include airfare, hotel stay with meals, sightseeing and lots more. Best Time to Visit in Thailand: The best time to visit most of Thailand is between November and February, because it rains the least and it is not too hot. Thailand Culture: Buddhism heavily influences Mainland Thai culture.